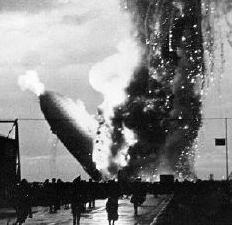 On May 6, 1937 the airship "Hindenburg" burst into flames over Lakehurst, New Jersey. The Hindenburg was a large airship that was viewed by many as a safe, fast and inexpensive means of air travel. The ship was 803 feet in length and 135 feet in diameter. It took 7 million cubic feet of hydrogen to operate. A year earlier, the craft broke a Trans Atlantic speed record by 6 and a half hours of travel. While coming in for a landing, a spark ignited the hydrogen sending the balloon in a ball of fire crashing to the ground. However, despite the destruction, 61 passenger and crew survived by jumping from the burning ship.